In looking over our list of possible cocktails, I ran across one we had been considering for quite a while. Today’s entry is actually the modern creation of bartender Greg Best, then of Holeman & Finch in Atlanta and appeared in Imbibe Magazine in 2009. We actually tried (and photographed) it back it 2011, and had to have another go at it today as a refresher. And a good decision it was. 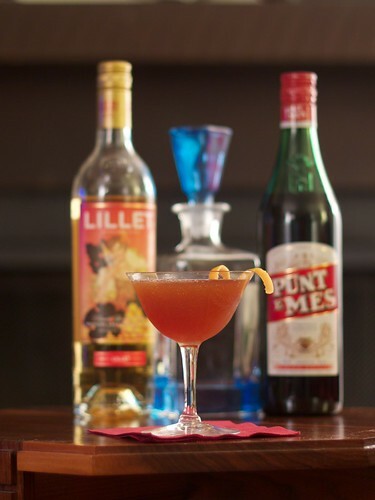 What first attracted me to this modern potation was it’s classic style…just a few venerable old ingredients, with a twist (the grapefruit and the Lillet) to give it a unique quality. The salt is a neat trick, too; it keeps the cocktail changing as you drink it. It’s hardly noticeable (at least with the sea salt that we used) in the beginning but becomes more noticeable as you drink it. Salt and citrus being a good combination, this is a nice change as the drink progresses. Shake all ingredients and strain into a chilled glass. Sprinkle sea salt over the surface of the drink. This cocktail is tart (with a bitter edge from the grapefuit) and refreshing. The Lillet seems to keep it from being overly harsh. A thoroughly enjoying summer drink.